I've been trying to reply but why he hell is it saying the body is not enough and is it not a complete sentence? Maybe the twenty character limit is too high? I thought there was a saying that a picture contains a thousand words? What is this picture trying to say? That, um, Kirby is sexyyyyyyyyyyy??? 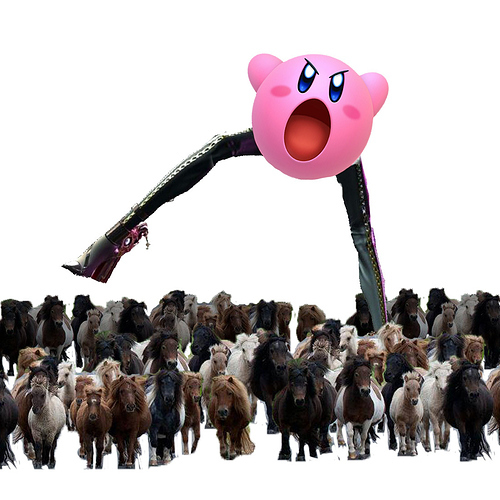 Is that Kirby horsing around? Did you know that image is a perfect reply for this topic? Are you assuming those horses are duck sized in that picture? Is Kirby duck sized or he is bigger? Do ducks only come in ONE size? What about Kirby sized ducks? If Kirby sized duck inhales Kirby, does it become Kirby sized duck Kirby? Does the pill really hard to swallow? are pills named after Dr Phill? Does Dr.phill looks like pills? Is Dr. Phill friends with Dr. Pepper? Does Dr. Pepper likes pepper too? Is Dr. Pepper really a doctor? does he has a doctorate in pepper?